Clemson Girl: Who gets the keys and who’s riding shotgun? Clemson vs. FSU game prediction. Who gets the keys and who’s riding shotgun? Clemson vs. FSU game prediction. According to Clemson head coach Dabo Swinney, the Clemson Tigers and Florida State Seminoles are playing to decide who has the keys and who’s in the back seat for the trip up I-85 to the ACC Championship game. 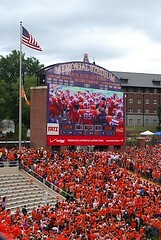 This game is why young men come to Clemson- to win championships. It’s 80,000 of their biggest fans losing their voices. It’s Solid Orange. It’s the most exciting 25 seconds in college football. It’s taking on a ranked FSU squad. It’s playing against a top- five defense. It’s defending your home turf. It’s putting the FSU war chant and tomahawk chop on mute. It’s sending the Seminoles home with a loss for the fifth straight time. Let’s check out the match ups for this week’s ACC showdown. Last week the key to the game was which defense would step up and make one stop that the other team couldn’t. This week Clemson’s defense will have to apply the pressure and force the already shaky FSU offense into mistakes and turnovers. If Tajh Boyd can continue to manage the game and get the ball to his play makers behind a much improved offensive line, the Tigers can continue their winning streak against the Noles in Death Valley. I was happily surprised and willing to eat crow last week and I need the Tigers to prove me wrong again. My heart says Clemson wins, but X’s and O’s say the Seminoles leave the Valley with the win. Post authored by Clemson Girl sports blogger, Nikki Steele.